lol, love this post! i have things that go walkies all the time! I think it was telling you it wasn't meant to be since we FINALLY have summer weather! @Debbie, do they ever come back? I'm still hoping mine will although I can't imagine where else it might be hiding! 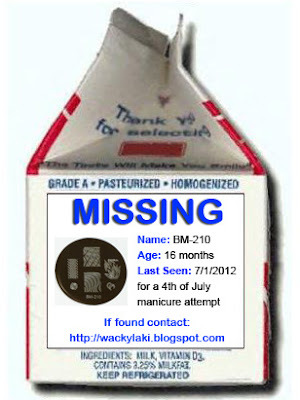 Heehee love the milk carton! I discovered just yesterday that nailpolishcanada.com sells individual bundle monster plates but I think it might just be for the 300 series. Worth checking out? This might just be the most awesome blog post ever! Hilarious! I hope you find the wayward plate! My sympathies on your walk-a-bout nail plate. It's probably hanging out with my missing Cheeky #7 plate. @nail crazy, thank you! I haven't given up hope yet that I'll find it! Fingers crossed!